Laboratory of Microbiology and Biotechnology, Faculty of Pharmacy, Universitas Indonesia, Kampus UI, Depok, 16424, INDONESIA. Introduction: An independent effort in term of pharmaceutical raw materials procurement in Indonesia, especially skin brightening agent, is required due to the high demand of brightening skin care product. One of the skin brightening agent widely used in cosmetic skin care formulations is kojic acid. 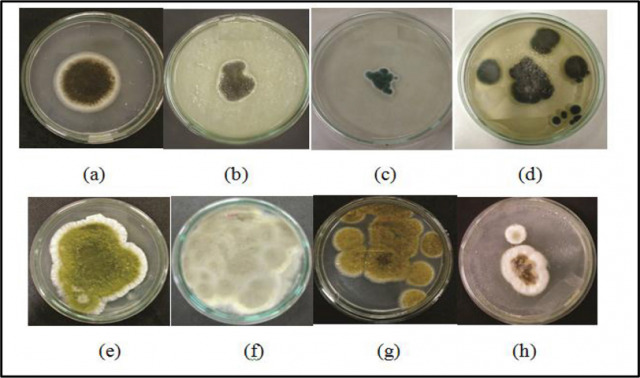 This study aimed to obtain the isolate of kojic acid producing mold from nature and its optimum fermentation condition by using various complex carbon substrates. Methods: Aspergillus oryzae was used as reference. The isolates of fungi were screened with different substrates variation, namely sucrose, corn starch, cassava starch, and cellulose hydrolysate. Then, each of culture was dripped with FeCl3 1% and the most brownish-red color formed was selected as mold and media for further process. The preculture of selected isolate and A. oryzae, were inoculated into 100 ml of fermentation media respectively and incubated at room temperature, 180 RPM for 10 days. The concentration of substrate was varied to 5, 7.5, and 10%. The levels of kojic acid were determined by TLC densitometry with UV detector at 318 nm. Results: IHJ2K isolate in corn starch-yeast extract was selected as the best mold and media. However, the highest level of kojic acid was produced by Aspergillus oryzae with 10% of substrate, with kojic acid concentration of 5.22 g/L. The most efficient fermentation was obtained from A. oryzae with 7.5% of substrate, with the obtained yield of 0.53 g/g. Conclusion: Potential kojic acid producing mold namely IHJ2K was successfully isolated. The selected carbon source for optimum kojic acid fermentation condition with IHJ2K isolate was corn starch combined with yeast extract, KH2PO4, and Mg2SO4.7H2O. Suwarjo ID, Azzahra AF, Suryadi H. Isolation of Kojic Acid Producing Mold using Complex Carbon Sources. Pharmacognosy Journal. 2018;10(6):1089-1092.